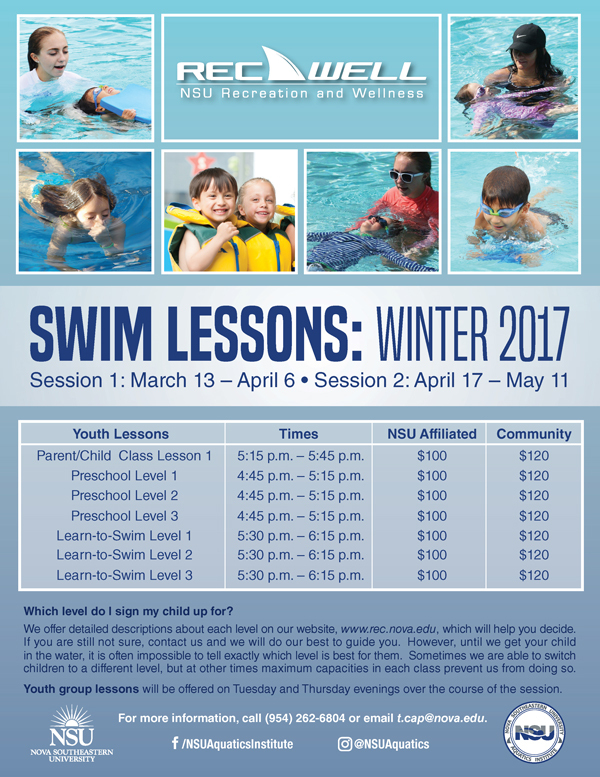 Youth Swim Lessons are now open for registration with our NSU Aquatics Institute. We offer detailed descriptions about each level on our website, www.rec.nova.edu, which will help you decide. If you are still not sure, contact us and we will do our best to guide you. However, until we get your child in the water, it is often impossible to tell exactly which level is best for them. Sometimes we are able to switch children to a different level, but at other times maximum capacities in each class prevent us from doing so. Youth group lessons will be offered on Tuesday and Thursday evenings over the course of the session. 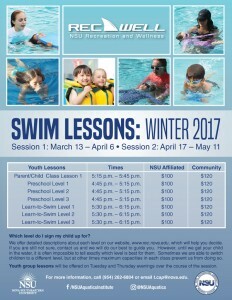 Sign up at nsuaquatics.com today! For more information, call (954) 262-6804 or email t.cap@nova.edu.